On Nov. 3 (Japan Standard Time), the Government of Japan announced the recipients of its Fall 2018 Decorations. 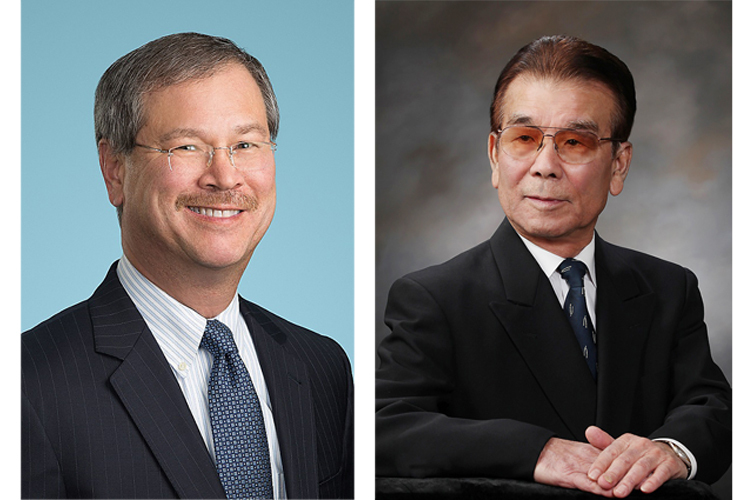 From the jurisdiction of the Consulate General of Japan in Los Angeles, the following two distinguished persons will be awarded. Information about a conferment ceremony will be provided at a later date. Edward A. Perron, 64, of Los Angeles will receive the Order of the Rising Sun, Gold Rays with Rosette for contributing to promoting friendly relations between Japan and the U.S. and strengthening Japanese American communities in the U.S.
Chogi Higa, 77, of Gardena will receive the Order of the Rising Sun, Gold and Silver Rays for contributing to promoting the Japanese language and the welfare of Japanese nationals residing in the U.S.
• Edward A. Perron was born in Washington, D.C. in 1954. His father, a career member of the U.S. Air Force, with his mother and sister, had previously been stationed three years in Nagoya, and Perron grew up with several Japanese mementos that his family had brought home. After undergraduate studies at Harvard College, he entered Harvard Law School and upon graduation joined the law firm of Lillick McHose & Charles in Los Angeles – now Pillsbury Winthrop Shaw Pittman LLP (Pillsbury) – a notable law firm with an established interest in Japan. Over the years, Perron has worked with more than 100 Japanese companies as a Japan specialist lawyer, and he currently oversees Pillsbury offices around the world as the firm’s global managing partner. Through his association with Pillsbury as well as nonprofit organizations for nearly 40 years, Perron has worked toward strengthening Japanese American communities and promoting friendly relations between Japan and the U.S. Since 1980, Perron has been associated with the Japan America Society of Southern California, which promotes friendly ties and positive exchange between the two countries. He served as a director of the society for 38 years, as legal advisor for 27 years, and as the society’s chairman for two years during the preparation for its 100th anniversary commemorations. At that time he established an endowment fund and led the restructuring of the organization to provide a more enduring foundation for the management and development for the society. As one of the Japanese business co-leaders at Pillsbury, Perron has been a leader in engaging with and supporting Japan-related organizations. Pillsbury has been providing financial support for many years to important organizations in the Japan-related communities of Southern California, such as the Japan America Society of Southern California, Japanese American Cultural and Community Center, Japan Business Association of Southern California, and Japanese American National Museum. Among other accomplishments, Perron has served as a board member of the Los Angeles Junior Chamber of Commerce, Asian Americans Advancing Justice–Los Angeles, and Los Angeles Economic Development Corporation. • Chogi Higa was born in 1940 in the village of Nakagusuku in Nakagami, Okinawa Prefecture. After graduating from Futenma High School, he moved to the U.S. with the support of his uncle residing in Los Angeles, and worked at Hinode Tofu Company while continuing his studies. In 1970, he graduated from Woodbury University with a bachelor’s degree in international trade, and began working for Lucky Stores Inc. (currently Albertsons Companies) until his retirement from the company in 2001. For many years, Higa has been very active in various Japanese American community organizations. He served the Los Angeles-based Japanese language school Rafu Uwamachi Daini Gakuen from 1970 for 15 years as a volunteer. He served four years as vice chair and three years as chair, and contributed to the nurturing of youth and the promotion of Japanese language education and culture to the Los Angeles Japanese American community. He served as president of the Okinawa Association of America for five years, and established the Katayabira Uchinaaguchi (“Let’s Speak Okinawan”) Class, Senior Citizens Club, and Library. In 2005 he was awarded by the Okinawa Association of America, and the following year at the fourth Worldwide Uchinanchu Festival of Okinawa heritage, he was appointed as a New Okinawa Goodwill Ambassador by Okinawa Prefecture to help build bridges between the U.S. and Okinawa. In 2011, to honor his contributions to the development of the Okinawa Prefecture heritage community and the friendship between Japan and the countries of the diaspora, he was awarded at the fifth Worldwide Uchinanchu Festival. Higa also dedicated himself to promoting Japanese and Okinawan culture through radio programs. For 11 years he volunteered as a radio personality for the 24-hour radio station Team J Station on its program “Haisai Uchinaa” (Hello Okinawa), and two other programs on regional Japanese radio stations. He contributed greatly to the operation and continued broadcasting of Japanese radio shows that supported the preservation of Japanese language use in the Japanese American community.The programs also introduced Okinawan dialect and culture, and Higa was instrumental in passing down language and culture, particularly to the younger generations. In 2011, Higa was appointed as president of the Japanese Prefectural Association of Southern California, which is the associated body of the 42 Japanese prefectural organizations in the region. In March 2011, when the Great East Japan Earthquake struck, he played a central role by taking the lead in communications with U.S.-based organizations in the midst of the turmoil in the Japanese American community at the time. In addition to gathering a total of $180,000 in relief aid, he delivered rousing words of encouragement to the victims at events beginning with the Great East Japan Earthquake Victims 100th Day Buddhist Memorial Service, and including many others. He contributed greatly to the cohesion of the regional Japanese American community and its relief efforts.